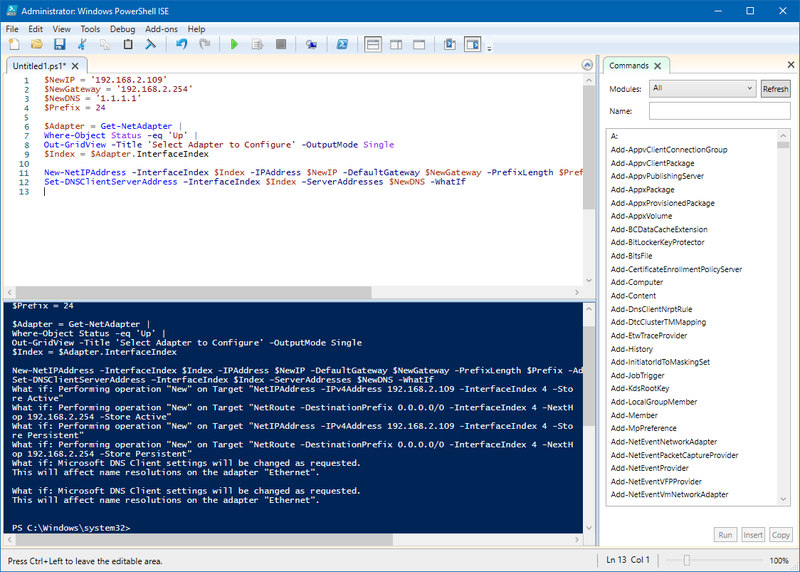 In this article, I’ll show you how to configure a static IP address on a system that has one network card through PowerShell. This can be useful when you have many servers and you would like to automate the IP addressing. Below a simple example that will illustrating how you assign a IP address, gateway, and DNS server to a network adapter. The script lists all active network adapters, and when you select one network card and click on OK it uses the hard-coded addresses to assign the new values. Note: the script above only pretends to do the changes. Remove the -WhatIf parameter to actually assign the new values. That is it. As you have seen this is a very simple and quick way to change IP settings for a network adapter using PowerShell.